I’ve walked to the top of Helvellyn an uncounted number of times over the last 30… 35… years, but I’ve never swum in Red Tarn, although I’ve often wanted to. I am usually with people who tell me this would be ridiculous, or it is freezing, or I do not fancy walking home in soaking wet pants, or I have taken other ways up to the peak which have afforded a bird’s-eye-view, but do not take me actually past this tarn, one of the highest in England, Google tells me. This time I came prepared, not only with costume but shoes to swim in (so as to avoid this sort of scene). But it is one thing to want to leap into the clear, cold, deep and gloomy-blue waters of the tarn; and quite another thing to actually be there, staring into her inky depths. 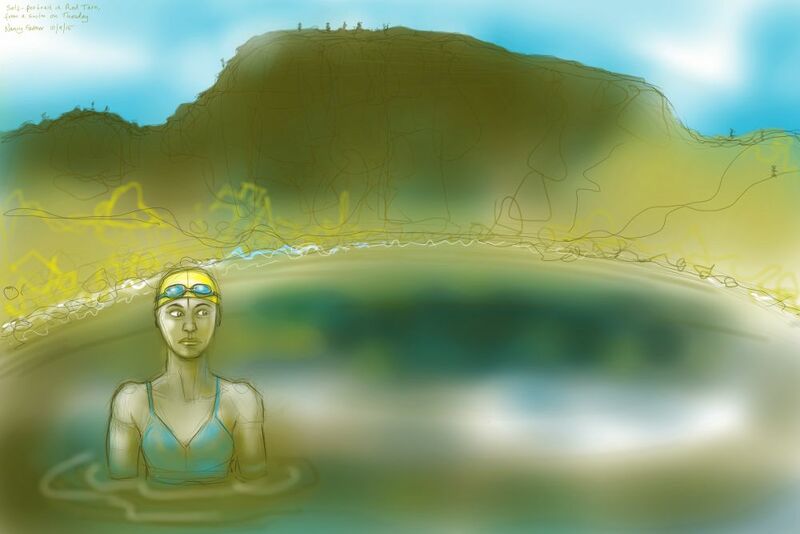 This entry was posted in Portraits, swimming and tagged art, cold water swimming, Cumbria, digital sketch, drawing, Lake District, Red Tarn, self-portrait, tortoiseshell cat, wild swimming on September 10, 2015 by Nancy Farmer.